Warm greetings from freezing cold Japan. CROSS FIELDS are pleased to launch our newsletter, which will allow us to keep you up to date with exciting activities we are carrying on! We plan to publish our newsletter every three months. Hope you will enjoy it!! Six Japanese companies (namely, Terumo Corporation, NEC Corporation, Panasonic Corporation, Hitachi, Ltd., Hitachi High-Technologies Corporation and Benesse Corporation) send a total of ten employees to local NGOs and social enterprises in five Asian countries starting from January 2013 for International Corporate Volunteering Program organized by CROSS FIELDS. The dispatch period is from one month to six months. Panasonic Corporation was the first company to introduce International Corporate Volunteering Program in Japan and by now six companies have decided to introduce the programs successively. Although the purposes of introducing the program are various depending on companies, the main reasons are “to cultivate human resources who have cross-understanding and ability to work with global stakeholders” and “to gain a knowledge of local culture and needs for new market development and product development”. Those aims are significant issues when thinking of Japanese business in the future. Furthermore, the companies value the program as it not only helps them to attain the above-mentioned aims, but also provides opportunities to contribute to local communities in Asian countries. Thus, more companies are expected to introduce International Corporate Volunteering Program in the future. Subsequently, NEC Corporation, Panasonic Corporation, Hitachi, Ltd. and Hitachi High-Technologies Corporation will dispatch their employees from February to April to Indonesia, India, Vietnam, Laos and Cambodia, respectively. How those projects go will be reported in the next CROSS FIELDS’ Newsletter. Terumo Corporation is a leading company in Japan that manufactures and sells medical products and equipment. 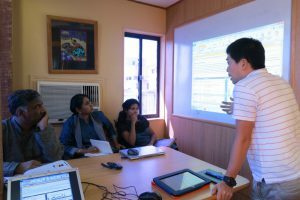 In January 2013, a member of R&D department of Terumo, aged 29, started working as a Corporate Volunteer at a health NGO in Indonesia. The organization runs several clinics in and around Jakarta for more than 30 years and well-experienced doctors and nurses are actively engaged for the betterment of healthcare of the people in the communities. 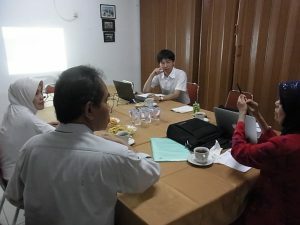 The organization called in the volunteer from Terumo expecting that he, who is well-acquainted with high-quality medical care in Japan, would be able to recommend improvements to the clinics. In the first week, having interviewed staffs at the organization and carefully observed the clinics, the volunteer focused attention on handling of syringe needles which are used daily at the clinics. 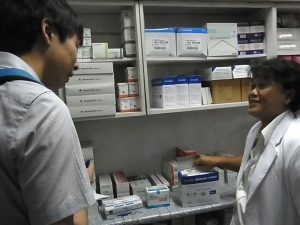 While the volunteer evaluated that the clinics are managing needlestick injury adequately, he has noticed that there is still room for further improvement from a Japanese medical point of view. Therefore, the organization and the volunteer agreed that he would work, during his two-month posting, to indicate areas for improvement of the needlestick injury control, provide a training to clinic staffs to raise awareness and implement an improvement plan together with the clinic staffs. Furthermore, in response to the organization’s request, he will also work to propose a method of quality control of syringe and needle, as the organization has been asked by National Coordinating Board on Family Planning to evaluate the syringes and needles distributed to the Government and private clinics in order to support the use of injectable contraceptives. After spending a week in Indonesia, the volunteer said “when working at a large company in Japan, sometimes we feel far from the people whom we serve. I am very impressed with how closely the staffs of the organization and clinics are supporting patients and people in the communities.” The representative of the NGO said that it would be a great opportunity for both the volunteer and the organization to learn from each other. 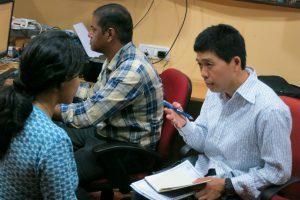 Benesse Corporation, Japan’s largest private education institution focusing on correspondence education and publishing, sent a 36-year-old HR specialist in January 2013 to an India-based social enterprise, which provides English learning materials and trainings to schools in rural and semi-urban area. Although this social enterprise has been rapidly expanding their activities, a CEO recognizes room for improvement in the measurement scheme in their training programs. In a-month-long project, the volunteer is working on measurement scheme reinforcement for the teacher training program by making the most of his ability and experience in the relevant field. At the early phase of the project, the volunteer was able to understand the entire process of the teacher training by attending several workshops for teacher training and visiting some schools. “Honestly speaking, I was doubtful about the outcome of the program. But, we were surprised by the speed of the volunteer’s understanding and his strong commitment. So far, we are extremely positive about the project.” The CEO said to Cross Fields’ staff at the end of the first week. Going forward, the volunteer will visit more schools to closely observe the teacher’s performance and find out possible issues to be solved. Based on the discussion with the CEO and the person in charge, the volunteer is supposed to write a recommendation report and hand it over to person in charge by the end of the project in mid-February.